I took this picture while in the metro. Isn't that strange? Why didn't I wait until I got to my apartment? Obviously the picture isn't great, but I never got around to retaking it. When I was visiting my family, my parents and I went to my sister's family. She and my brother in-law are building a new home and will shortly have a new baby. They have many exciting new changes coming their way! They live near Arches National Park, and we were able to do a little hike. 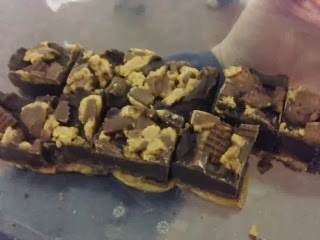 While there, I also ate an outrageous amount of some peanut butter cup fudge my sister had made. She got her recipe on Pinterest, but this version came from another blog. It is a pretty simple recipe. There are only 3 ingredients: 22 peanut butter cups, 3 cups chocolate chips, and 1 14 ounce can sweetened condensed milk. I lined a 9 square inch baking pan with foil. It would have been very difficult to remove the fudge from the pan without any foil. I placed 16 peanut butter cups on the bottom of the pan. In a saucepan, I combined the chocolate chips and sweetened condensed milk. Apparently, sweetened condensed milk is made from whole milk, and 40% of it is sugar. You know it's tasty because the ingredients are the same as ice cream. It is heated until 60 percent of the liquid in the milk has evaporated. The difference between sweetened condensed milk and evaporated milk is only the addition of sugar in sweetened condensed milk. Evaporated milk was invented in the early 1800s to increase milk's shelf life. During the Civil War, the US government ordered lots of evaporated milk as a ration for Union soldiers. On medium heat, I stirred the chocolaty goodness until the chocolate was completed melted and combined with the sweetened milk. I poured the chocolate over the peanut butter cups. After smoothing the chocolate with a spatula, I sprinkled on the 6 remaining peanut butter cups, which had been vigorously chopped. I pressed the chopped peanut butter cups into the fudge with my immaculately clean hand. I let this cool in the refrigerator for a few hours. After it had cooled completely, I cut it into squares and consumed. How could this not be good? These are decadent and rich little morsels, though they may cause diabetes. You could swap out peanut butter cups for other candy. Almond Joys or Snickers would be delightful encompassed in a thick layer of fudge.